I just noticed that Mr. Potato Head and Michael Nutter have the same nose. It should be easier to switch it than you thought! They also have the same moustache. Where is this spud farm? Um–I thought my personal info had been saved previously. Why do they need to hide? Despite the name they are not made out of potatoes. Sassy, I took this photo at the Bloomsburg fair. One of the prize categories appeared to be “collections of things.” There was this collection of potatoheads, a collection Tonka Trucks, etc. Of course it does. 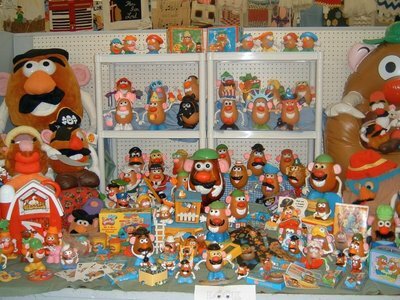 Mr Potato Head is made of plastic, not potatoes.